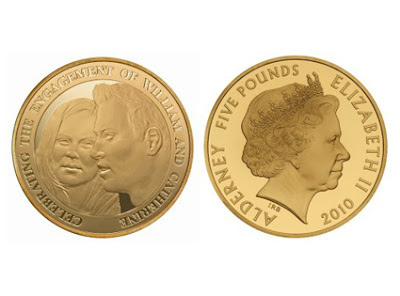 So the British Royal Mint put out a coin commemorating the engagement of Will and Kate. There are a couple of things wrong with it...Kate Middleton looks like a fugly betch with a slightly broken nose AND Willy has way to much hair, they were way to generous with extending his receding hair line. I would be so pissed if I was Kate. She is actually really pretty so this is a great travesty if you ask me, but obviously no one did or this garbage would have never gone to print. Supposedly the Queen ok'd it. Pfft, guess we know that she is not on team Kate.